Often in business, we find ourselves waiting for reports to be compiled or for a time frame to be completed before we can continue with the next step. This is often the case when it comes to rewards. You are often expected to present an award for a certain time period however only once that time period has ended; whether that is a month, a quarter or a year. Many systems allow you to do live updates, but what about post-dated updates? The date of input is not necessarily reflective of the date of occurrence. The input details will then in turn affect the reporting from that system thereby you’ll end up with June’s results reflecting in July’s reporting. Since we understand the practical administration that happens in a business, our ‘code-whispering’ developers here at Workpoints have made provision for this necessary feature. Take Sales Target Awards for example…these can only be announced after the month has actually finished. In which case, you need the ability to not only upload the winners, but also for the reporting to reflect accurately on each month’s winners. Employee of the Month is another example, whereby the information that will determine the winners or those who have met their targets will only be accessible after the last day of the month. With Workpoints, not only can you load an award after the time frame in which it has occurred, but the additional apps and supporting features, such as Leaderboard, will also reflect the data accordingly. 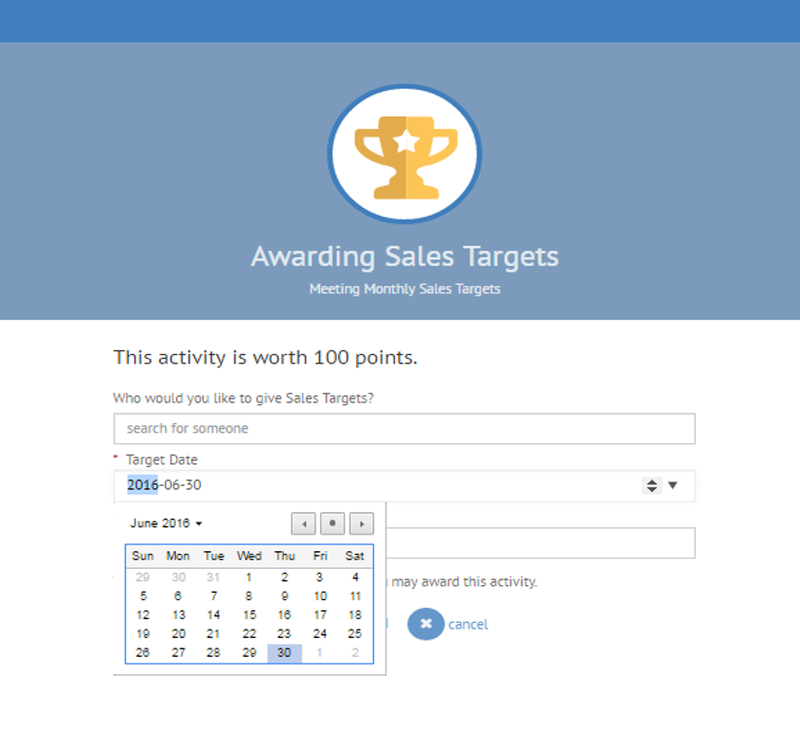 In a competitive environment, with our Target Date input feature, you can use the leaderboard throughout the month of June to give a live-time indication of who’s currently in the top 10. Once you’ve obtained final figures, which will typically happen in the first week of July once when you have consolidated the final week’s results for June, you can input the data and selecting your target date to be 30th June, not only will the award date reflect that this is for June but the leaderboard for June will also update therefore announcing the result. Yes…it’s as a simple as that.